My zucchini plants are really starting to take over the garden and my refrigerator crisper drawer was already filled so my wife and I decided to experiment last night with grilled zucchini pizzas, using a recipe I found here. I wasn't really sure what to expect from these. But, they did turn out to be surprisingly good. 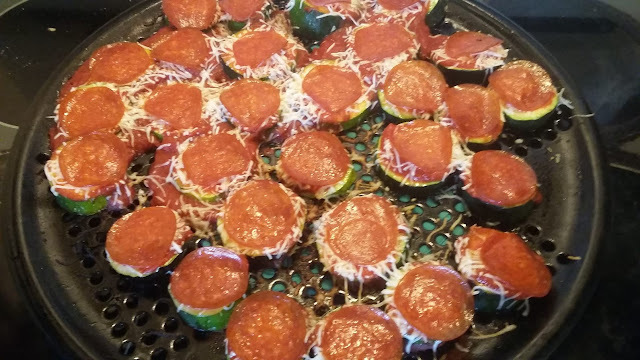 The butter/garlic that is spread on the zucchini while it is grilling adds a nice complementary taste to the pizza sauce and we were able to make them even more pizza-like by adding a slice of pepperoni to each of them. They also proved to be very filling. I wasn't sure if we made enough (we sliced up two medium-sized zucchini). But, there was enough leftover for me to bring some to work with me for lunch (I'm sure it won't be as good warmed up though). 1. Don't go by the cook times in the recipe because thicker slices take longer to cook than thinner slices. You'll want to wing it when making these and add the pizza sauce and cheese when the pizzas are nearly done. 2. These are quite messy so we ended up using a pizza pan (one meant for a grill) when making them rather than putting them directly on the grill. 3. The melted butter and garlic creates quite a bit of smoke when it comes in contact with the fire. So, you'll want to avoid slopping if possible.